If you or someone you know is suicidal, get help immediately via 911, the National Suicide Prevention Lifeline at 1-800-273-TALK or the Crisis Text Line (text “HOME” to 741741). 1. Youth suicide is a serious problem. Suicide is the leading cause of death among school age youth. In 2015, approximately 18% of 9th to 12th graders seriously considered suicide with 9% having made an attempt one or more times. 2. Suicide is preventable. Youth who are contemplating suicide typically give warning signs of their distress. Most important is to never take these warning signs lightly or promise to keep them secret. Changes in behavior, appearance, thoughts, and/or feelings. 5. There are protective factors that can lessen the effects of risk factors. These can include family and peer support, school and community connectedness, healthy problem-solving skills, and easy access to effective medical and mental health services. 6. Schools have an important role in preventing youth suicide. Children and youth spend the majority of their day in school where caring and trained adults are available to help them. Schools need trained mental health staff and clear procedures for identifying and intervening with students at risk for suicidal behavior. 7. The entire school staff should work to create an environment where students feel safe. School mental health and crisis team members are responsible for conducting suicide risk assessment, warn/inform parents, provide recommendations and referrals to community services, and often provide follow up counseling and support at school. 8. Collaboration between schools and community providers is critical. Establishing partnerships with local community mental health agencies helps connect students to needed services in a timely manner and helps smooth re-entry to school. 9. Never ignore or keep information a secret. Peers should not agree to keep the suicidal thoughts of a friend a secret and instead should tell an adult, such as a parent, teacher, or school psychologist. Parents should seek help from school or community mental health resources as soon as possible. School staff should take the student to the designated school mental health professional or administrator. This handout was developed to parents and other caregivers who should be prepared to respond to youth who have thoughts of ending their own lives. 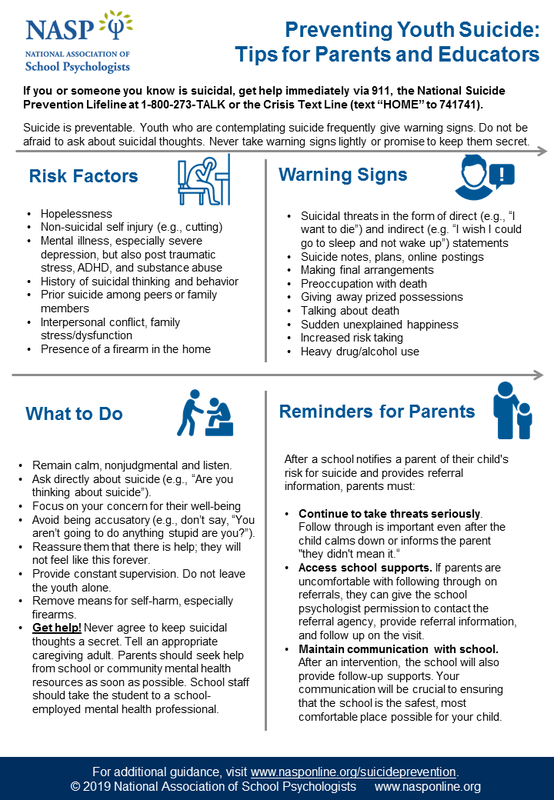 This article covers important topics school psychologists should know about suicide clusters. Suicide Contagion and Clusters—Part 2: What Can a School Psychologist Do? This article shares steps school psychologists can take to contain suicide contagion. Schools have a legal and ethical responsibility to recognize and respond to suicidal thinking and behavior. 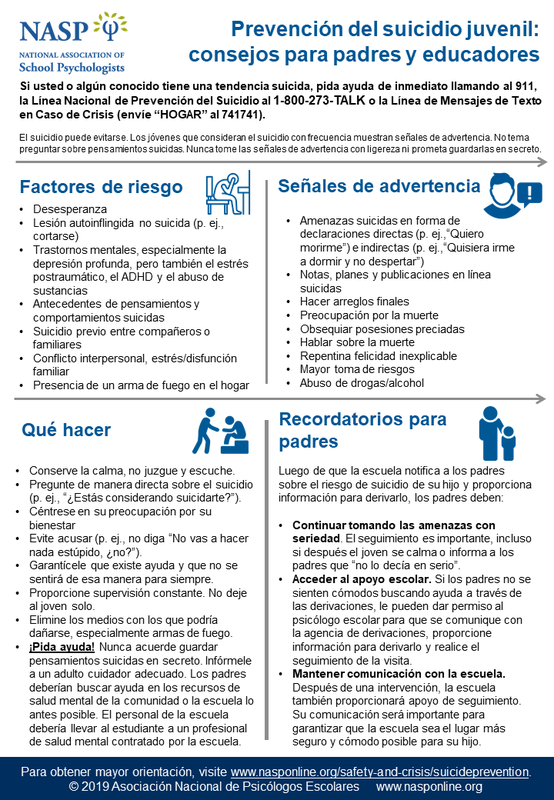 Share this handout with basic information and tips on preventing youth suicide with Spanish speaking students, families, and staff. NASP has issued guidance for families and educators in response to the 13 Reasons Why Netflix series.